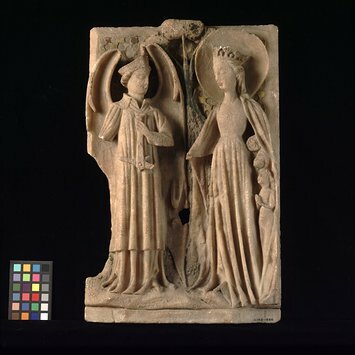 The Virgin Mary stands on the right sheltering two souls under her left arm while St Michael stands on the left holding the top of the scales in his left hand. As the Archangel Michael weighs a sould in judgement, the Virgin stretches out her rosary to redress the balance in favour of mercy. The panel is damaged and it is possible to reconstruct the damaged details of this panel from other surviving examples. The winged saint, wearing a tiara surmounted with a cross, an alb and amice, stands on the left of the panel, looking right. He holds the shaft of a weighing balance in his left hand. The crowned and haloed figure of the Virgin, wearing a close-fitting gown, stands on the right of the panel, facing left. She shelters three souls, one of whom is represented only by the back of the head, under her cloak beneath her left arm. A stylized tree is between the two principal figures. Much of the weighing balance, including the weighing pans, is missing, and there is a hole in the lower centre of the panel and a large piece missing from the lower left-hand side. Traces of green paint remain and the usual daisy pattern. The upper background is gilt, with traces of gesso knobs. There is green with some reddish brown on the tree. There are traces of red in the folds of the Virgin's cloak. The back of the panel bears three lead-plugged holes with latten wires attached. Acquired by Dr W. L. Hildburgh in Paris. On loan from him since 1922. Given by Dr Hildburgh in 1946. 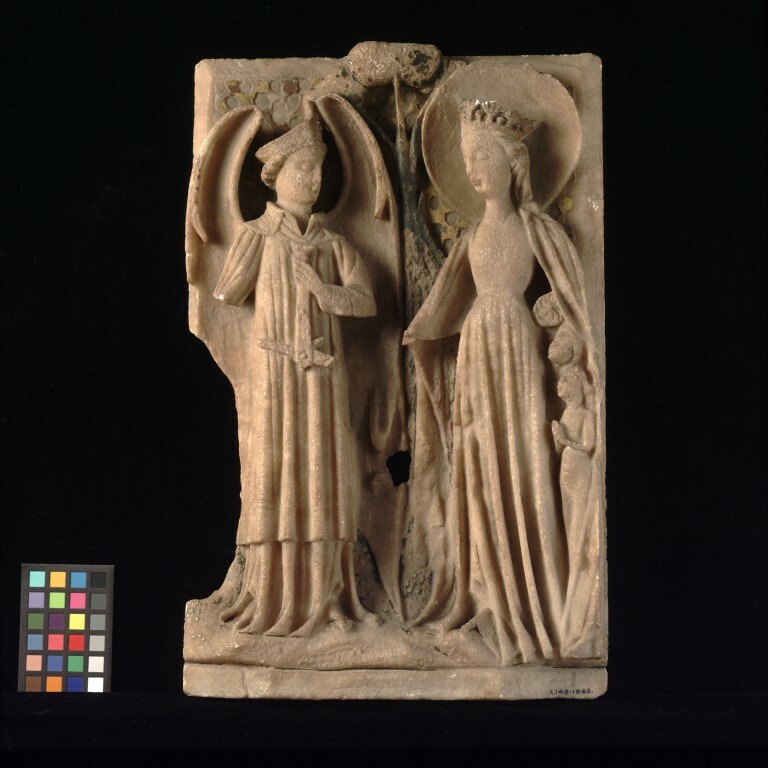 Alabaster panel depicting St Michael weighing souls with the Virgin interceding. English, 15th century.